after Fenton began marking wares with logos embedded into the glass! 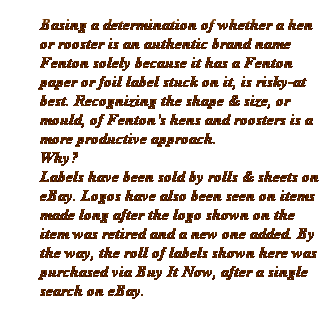 Therefor, all first quality Fenton roosters should be marked with one of Fenton's embedded logos. 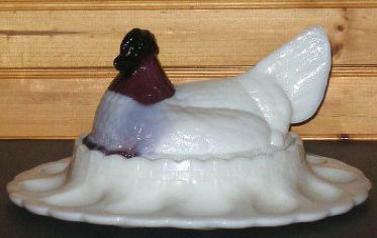 with the same logos used on Fenton's Hen on Nest dishes. denoting these items did not originate with Fenton. range, but with visible differences in and under the tail area, and other places. this color, 1955. (rare) Hen top is a copy of the 8"
base. 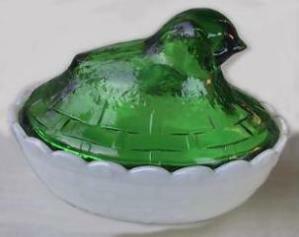 Fenton Chicken Server produced: 1952-1958.
was produced a couple years later in 1997.
the early summer of 2008, in Chameleon Green. nest in question. But, what these embedded markings can offer doesn't end there. 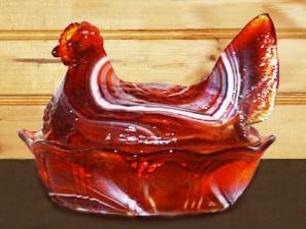 dishes, and also for their Roosters designed by Fenton's talented Designers, Jon Saffel and Suzi Whitaker. Indicators discussed and shown in the section below. roosters over the years.  Adding to that, is the fact that colors usually vary in appearance from PC to PC. tiny, albeit very helpful, numbers until the early 1980s. the photos to the right. from those underside of the base used with Fenton's 5" hen top. 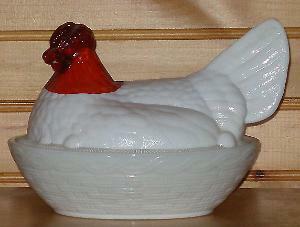 Although all Fenton roosters are marked, they are not all marked with the same type of logo. 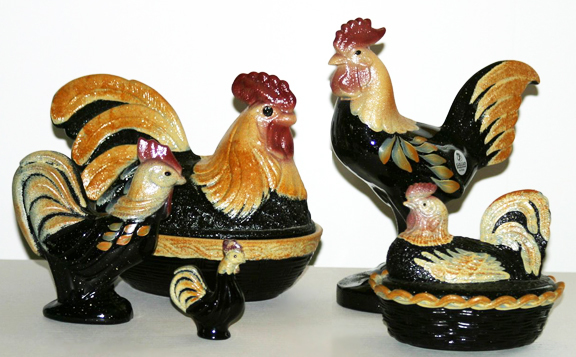 Fenton's "home-grown" roosters for each decade with an assigned number. This easy to recall Decade Indicator breaks down easily with no complicated codes to remember. the 0 is used for items made after 1999. Indicator. Base of #5186 CN, Carnival 5" Hen on Nest. Decade Indicator of 9. 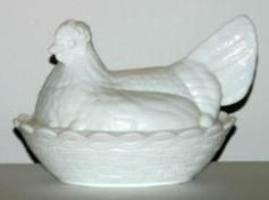 Base of #5186 KN, Cobalt 5"
Hen on Nest, YOP 1999.
for production outside of the USA. Rosso Glass special ordered in Limited Numbers. for the hen in question. Ware #5183 -- Not inline. Plate, Hand Painted, Ltd. Ed. of 950 pieces, 1995. Chameleon Green and Martha Stewart's Martha by Mail. debuted their revised 8" Hen on Nest. 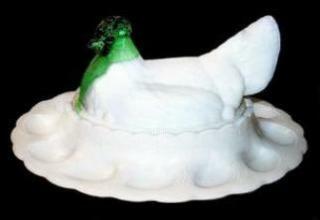 A familiar 8"
style, scallop rimmed basket-woven base. smooth rimmed, basket woven base, ware #5183. Produced from 1953 to its retirement early in 1958.
sell their wares until 2011, eventually Fenton did out-source some wares for production to be done overseas. despite all, has proven Fenton still has a remarkably loyal client base. also special ordered in Mint Green and Shell Pink. is also done to logos that have already been applied.  wonderful, and unique First Quality items can be found there! 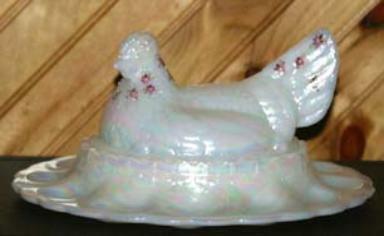 Fenton's hen on nest forms easier. 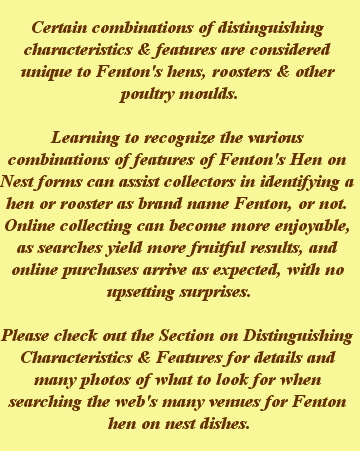 of Fenton's hen on nest forms. chicken dish that has no Maker's Mark, or at least none found by its seller. 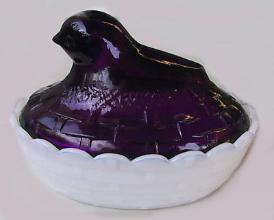 Often these unmarked hens are listed as "pre-logo"
embedding their logo, the complete word "Fenton" spelled out in an oval, in 1971 (see images and photos to right). 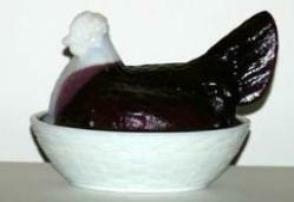 By 1972 the 8"
marked with the logo, shown to the right, used for Fenton's hens. different from those used with their rooster boxes and large standing roosters-the moulds for all of which came from outside sources. 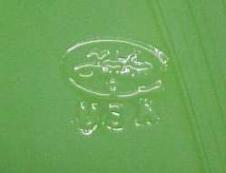 after early 2008 are marked with Fenton's logo-and USA! Ware #5185 GM, Chick on Nest, released in 1953. Servers and/or #5183 Hen on (smooth rim) Nest. 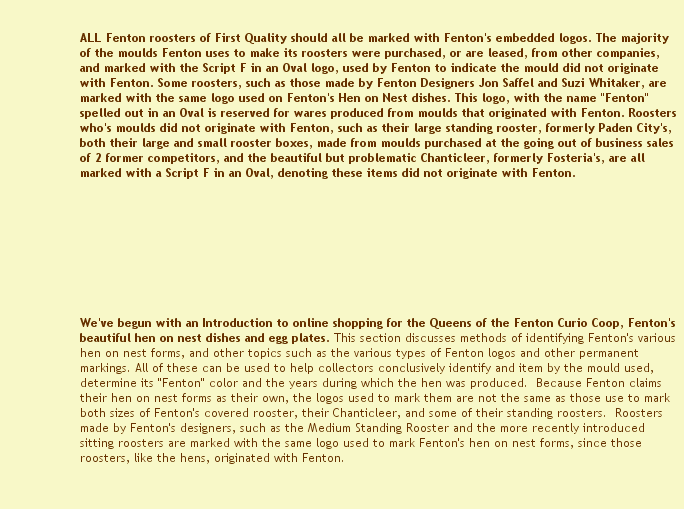 being painted by Fenton's artisans in the handsome decorative design for that year's Folk Art Collection. instead its decorated in colors resembling Burmese, usually on white glass. 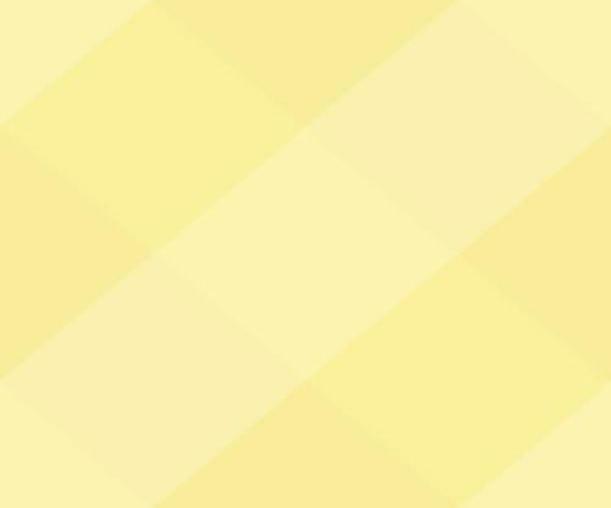 forms now known to exist, produced by more than 100 companies. are-and what they are not! essential to enjoying a successful online collecting experience. draining to the collector, to say the least. 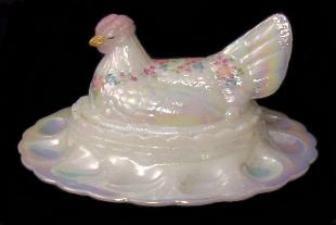 With sustained popularity on the Secondary Market the term "Fenton,"
less obvious in photos, so if you have doubts about the item contact the Seller. online collecting experience-especially when shopping on eBay. of Fenton hen on nest forms to clarify which of the gals arrived when! information about what hens were made when, and whether they are still being produced. 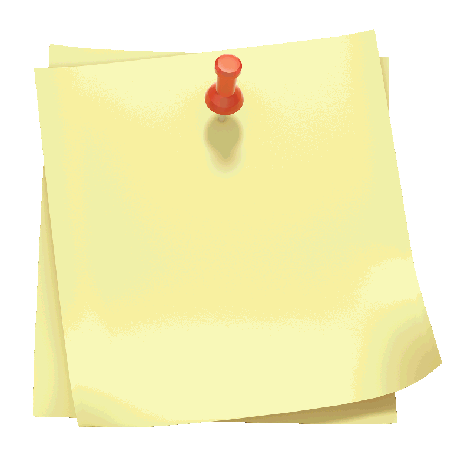 venues, including eBay, links to which are included below.  to the letter in order to be eligible for PayPal Buyer's Protection. Fenton, that catches even some seasoned eBayers by surprise. BRAND NAME THE ITEM IS LISTED AS PRIOR TO IT BEING LISTED ON EbAY! 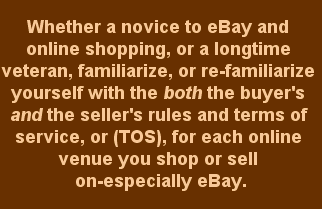 name, that Seller may be reported to eBay and the listing may be removed from eBay. per eBay and PayPal rules. homework-which eBay requires when selling items as a brand name! collecting can become more enjoyable-and in a sense, an art. mould number for the completed wares throughout the site. PC display. 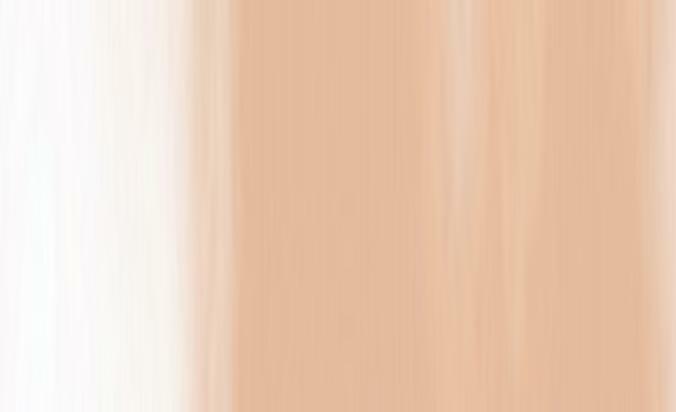 There are ways of pinpointing the colors which we discuss in the section on colors. whether its a solid 5" cat, or a 5 piece Epergne.  digit, or a combination of a letter and a number, code which represents the Fenton color of an item. 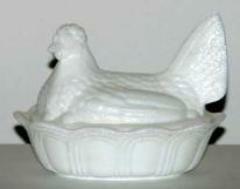 hens and roosters are some examples of this type of ware number. Detailed information about mould and ware numbers is included below. 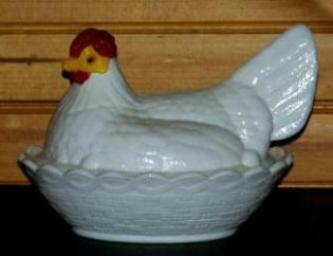 their hen on nest dishes. 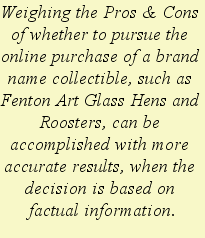 There are those who believe that a Fenton sticker on a glass item alone verifies the authenticity of that item as Fenton's. including the strip of unused Fenton stickers shown above which was easily found and bought for use on this site on eBay. category it goes-right or wrong. this is a personal opinion, and in the world of collecting-to each his own! The end of over a century long run of success by Fenton! 2011, 2012, 2013, 2014 All rights reserved. Stirrup Studio at Sweetwater Farms.